Catalog kitchens in this era could be lurid, but today&apos;s Mid-Century Modern kitchen revival remembers hominess and bright colors. Red and white, and other bold colors such as turquoise, are popular color schemes, and go well with vintage metal cabinets. 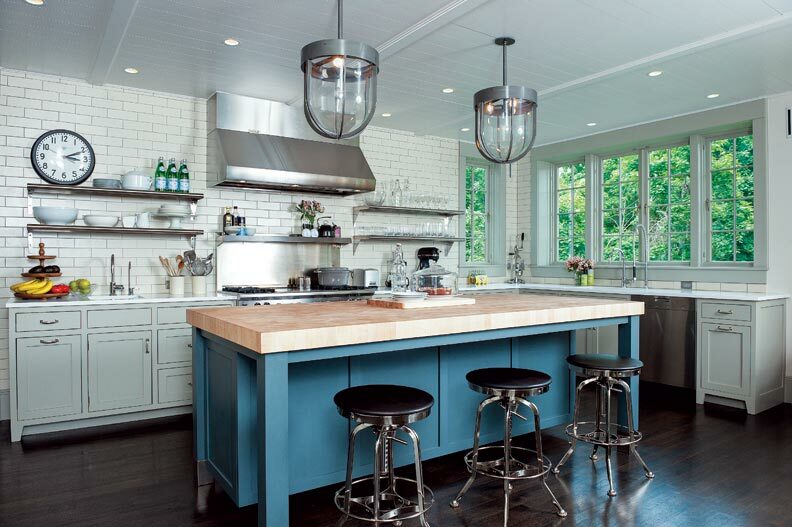 When designing your kitchen, decide between pop&apos;50s and cutting edge Modernism. Real linoleum is Forbo&apos;s Marmoleum &apos;Bleeker Street&apos; sheet flooring in red. Photo courtesy of Gross & Daley. Who doesn’t like an old-fashioned kitchen (or strawberry shortcake)? This one is in a 1926 Colonial Revival house, but recalls the late ’40s—inspired as it was by a collection of red-and-white vintage kitchenware. The kitchen had been remodeled in the 1970s, with a dropped acoustical-tile ceiling, sparkly Marlite and brown-and-gold vinyl wallcoverings, and dark cabinets. When that remodeling was pulled away, a 1950s version was underneath: blue linoleum and white metal cabinets. But a 1920s coal/wood stove (not shown) had remained stoic in its alcove, and built-in oak cabinets in the pantry were original. The collection of small appliances and cookware all started with a 1947 Daystrom chrome table-and-chairs set. Then there was the vintage sour-cream glass with its red rooster, a typical motif of 1940s kitchens. The glass led to a custom-cut linoleum floor. Walls are painted bright white; the vintage “Bantam” wallpaper border is from the 1940s. Custom cabinets mimic 1940s kitchen cabinets in old magazines; they have metal grilles, rounded shelves, and legs with a classic Deco winged design copied from an old freestanding cabinet. Over the sink, the Deco wing design is repeated in the wood valance that acts as a light baffle. Vintage (unused) chrome and red hardware was picked up from antiques shows and on eBay. The cabinets were topped with reproduction red “cracked ice” countertops and backsplash and aluminum edging with red inserts. A Fisher–Paykel double-drawer dishwasher hides in plain sight. 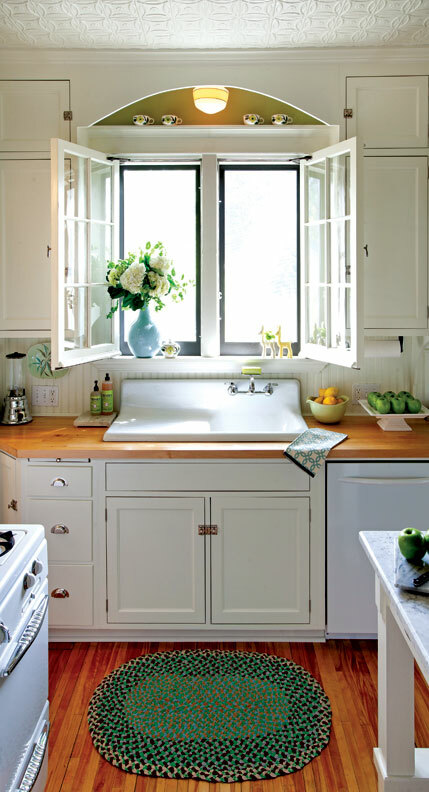 A highlight is the 1947 double-basin, double-drainboard white sink bought for $25. But the centerpiece of the kitchen is the restored red O’Keefe & Merritt ‘Hi Vue’ stove of 1955. The new kitchen was built within the original footprint, but with a wall removed. Display shelves and frosted-glass cabinet doors add to the openness. Photo courtesy of William Wright. 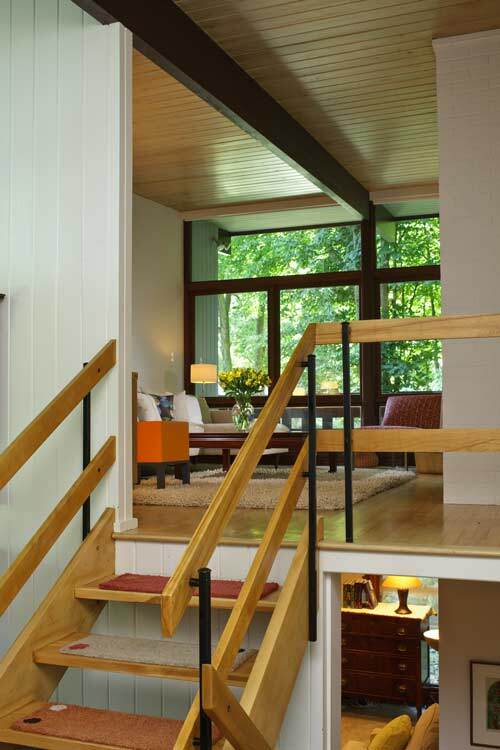 Mid-century modern residences are often said to be successors to the bungalow: simplified and naturalistic, meant to bring the outdoors inside. 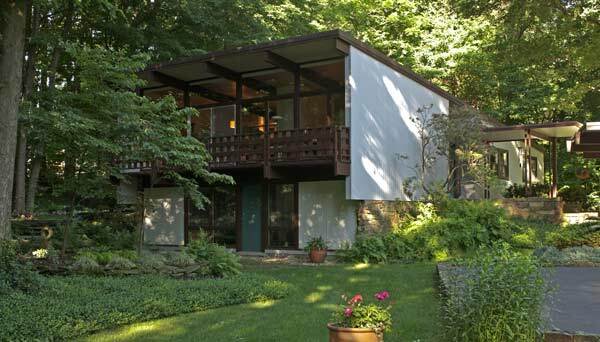 This house, a split level ingeniously designed to take full advantage of the sloped site, was built in 1958 by the Modernist Indiana architect Edward James. Walls of floor-to-ceiling glass in the living and dining rooms brings the forested setting indoors. Natural and sustainable materials include quarter-sawn red oak flooring, and Pennsylvania bluestone around the fireplace and for flagstones in the foyer. The open floor plan, soaring ceilings, and expansive window walls make a refreshing change from traditional Midwestern interiors. Set in the center of the upper level, the original Pullman kitchen was cramped and inefficient. Ash cabinets, stained dark, were awkwardly placed so that corners were inaccessible. The white laminate countertops and vinyl flooring were dated—not in a good way—and had reached the end of their lifespan. Lighting was inadequate. 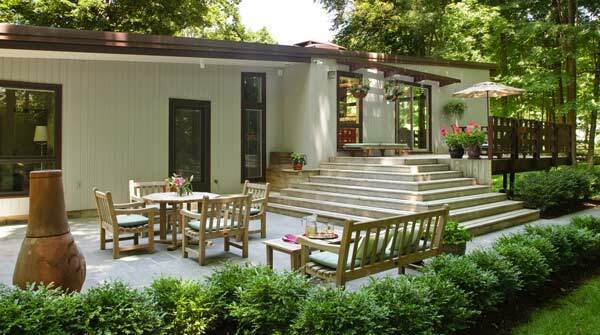 The owner, an architect, was careful to not over-remodel, retaining the simplicity and honesty of the design. 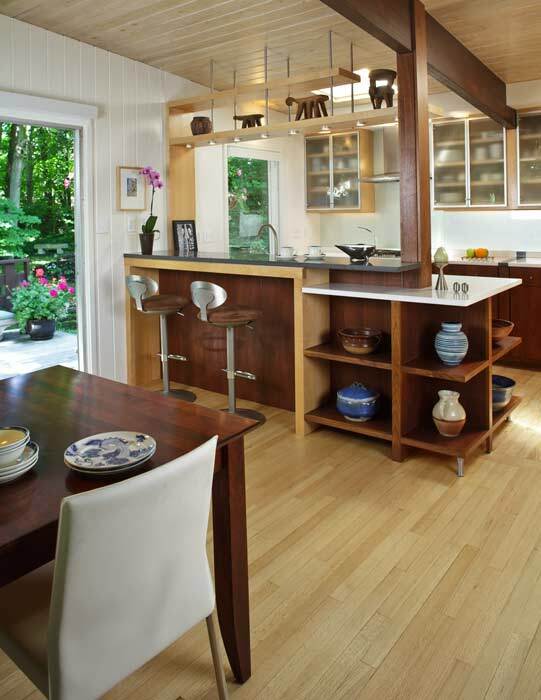 Working with cabinetmaker Nancy Hiller, who specializes in period-sensitive design, she stayed within the kitchen’s original footprint. The wall to the dining room was removed to allow for light and views. Open shelves of Peruvian walnut and maple define the space and display collections, including ceramics by local artisans and African market stools (on top). Quartz countertops are by Zodiac. Frosted glass adds to the openness. 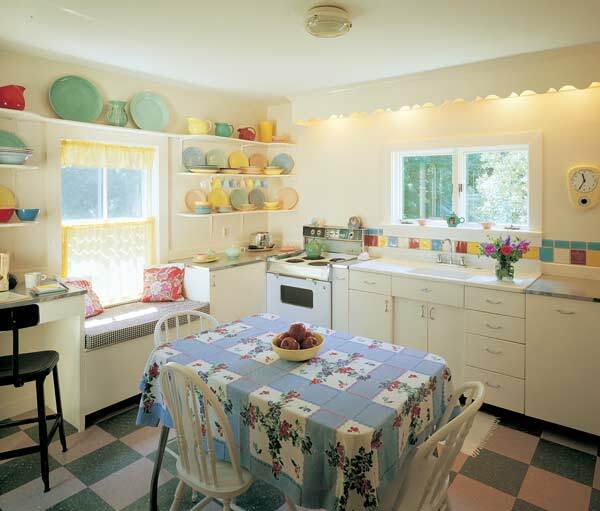 A cheery blend of new and not very old, this 1950-look kitchen was designed around metal cabinets and the colors in vintage tablecloths and LuRay dinnerware. Photo courtesy of Brian Vanden Brink. Can you imagine so happy a kitchen on so small a budget? It took the eye of an artist, talented friends, and colorful period pieces picked up at yard sales and flea markets in Maine. The remodeled and worn kitchen had to be stripped to the studs, but an old Youngstown sink unit with metal base was salvageable. That and the owner’s collection of LuRay dishware set the tone. More old metal cabinets were found, for just $100, and additional, site-built wood cabinets and shelving were painted glossy white to go with the metal ones. Everyday tablecloths of the 1940s and ’50s add more color, shown to best advantage against all the white and walls painted the palest pink. Colorado ceramist friends of the owners made and installed the tiles over the sink for the price of airline tickets. Besides the modest cost of a new floor—no-wax vinyl tiles—little money was spent. 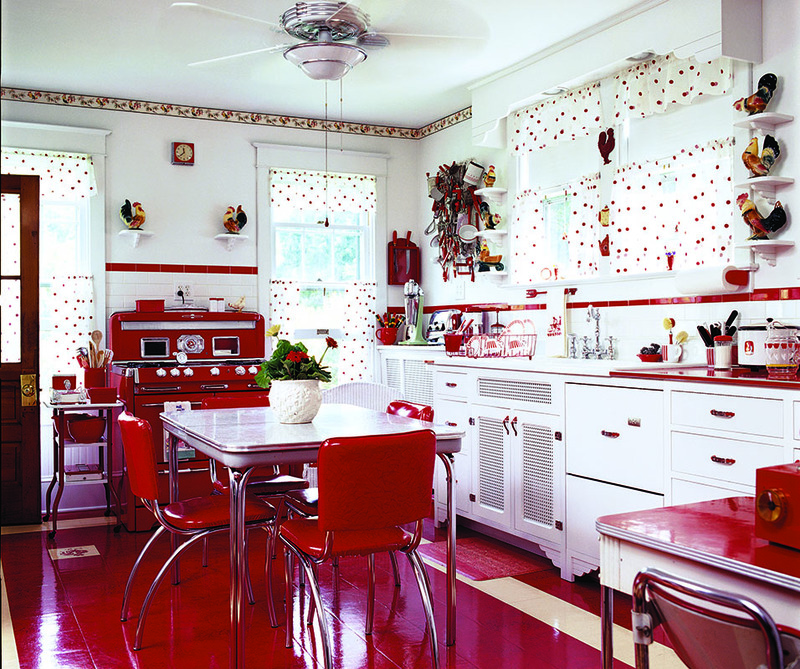 A collection of red-and-white vintage kitchenware provided the inspiration for this luscious retro kitchen.